Through filters ticking allows you to choose a product. Bodycasting Kit €29,95 Make your own professional bodycasting! Copy hands or feet with realistic details. A beautiful memory to have. Alginate 3D-Gel €9,95 Alginate (or 3-D Gel) is dried seaweed powder and thus a 100% natural product that is used primarily to copy parts of the body quickly and easily. Porcelain gypsum plaster €4,95 Porcelain gypsum is cast into molds, for reliefs, models, ornaments and reproductions of large shapes up to small highly detailed shapes. 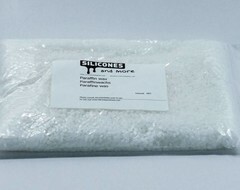 Silicone Addition Transparent 15 Fast €18,25 The Silicone Addition Transparent 15 Fast is a 2-component (poly-addition) pourable silicone which, very rappidly, cures at room temperature to a quite soft but strong rubber silicone. 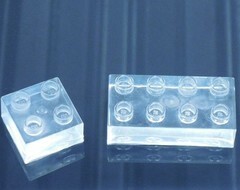 Polyester Clear Set €16,50 Polyester clear is an accelerated unsaturated polyester resin dissolved in styrene. Siliconen Culinair® €39,95 Siliconen Culinair® is the ideal mould material for your culinary creations. Polyurethane / Epoxy dye €6,75 Polyurethane dye can be used during mixing of the polyurethane or epoxy systems which you can find in our webshop. Plasticine €7,50 Plasticine is a synthetic putty which remains soft in contrast to normal clay. Wax Paraffin B600 €5,95 Wax Paraffin B600 is a good base wax and is used as a casting wax, or to mix with other wax types. Paraffin wax is a little weaker and shrinks more than microcrystalline wax. Paraffin wax is often whiter than microcrystalline wax. Alginate 3D Gel - 1 kg. €19,90 Alginate (or 3-D Gel) is dried seaweed powder and thus a 100% natural product that is used primarily to copy parts of the body quickly and easily. Plastique Culinair €26,25 With "Plastique Culinair" you easily create a food safe mould of almost any shape. Silicone Addition Colorless 50 (hard) €21,95 This set consists out of two component addition cure silicone that cures to a relatively hard but still very flexible transparent slightly yellow silicone rubber. This is ideal for stable moulds or even to toughen the silicone colorless 5 when mixed. Silicone Condensation 20 Starter kit €28,50 Silicone Condensation Starter kit 20 is based on our 2-component (poly-condensation) casting silicone suited for soap, candle and concrete moulds etc. Silicone Addition Transparent 40 Normal €0,00 The Silicone Additon Transparant Normal 40 is a 2-component (poly-addition) casting silicone which cures at room temperature to a strong rubber that is relatively hard. Polyurethane casting system D80 Set €14,00 Polyurethane casting system D80 Set is a polyurethane casting system consisting of an A component and B component. This PU results in a hard plastic that is very suitable for small to medium castings, fixing molds, foundry models, replicas and prototypes. Syringe €0,50 A syringe is useful for adding small quantities of material.